1) A cheap cell phone (such as a NOKIA1280) which has an "assign tone" facility, meaning a cellphone which can save a specific ringtone for a selected number and enable muting the remaining numbers, in simple words the cellphone will "ring" only to the selected (preferred) number and stay silent for other numbers regardless whether or not its from the phonebook or a wrong number. The above unit will be used as the modem and will remain permanently attached with the control circuit. and a 3) monostable 555 timer circuit. In the above designs the relay is seen to be activated using the attached modem cell phone's ringtone through its headphone socket. In the present pump controller design we implement the same but through a mic sensor which is utilized to sense the ringtone of the modem without making any physical contact with the modem cell phone. The lower section of the circuit incorporating the IC 741 and the IC 4017 forms a simple sound activated relay circuit, which toggles the connected relay alternately ON and OFF in response to the sound signals received on the MIC. Basically this circuit is used in clap switch circuits for toggling the relay with clap sounds. 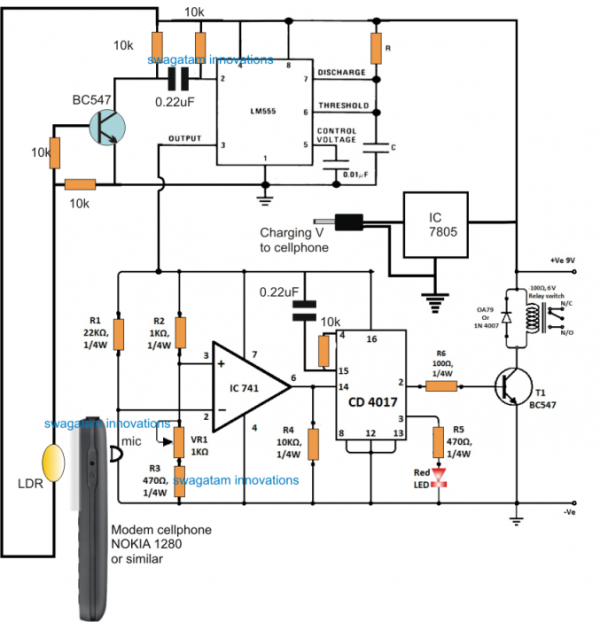 For the proposed application the sound is produced from the cellphone when the user calls the shown attached cellphone from his home or some distant location for operating the relay and the water pump. The idea looks pretty simple until here, however the mic could be triggered even with a false sound trigger generated externally in the filed, for example by an airplane sound flying close by or a vehicle such as a tractor engine sound etc. To eliminate this issue and make the circuit foolproof, a IC 555 monostable is additionally used with the lower section. The monostable is designed to trigger from the display light of the cellphone whenever a call is received. Therefore now it becomes a two pronged sensing device which will not trigger unless the light from the modem, as well as the ringtone sound are produced together. Whenever a call is made on the modem. The display lights up first and hits the LDR, the LDR resistance goes low triggering the BC547. The BC547 conducts and pulls the pin#2 of the 555 IC low which in turn enables its pin#3 to go high. The pin#3 output from the IC 555 powers the lower section, which now becomes ready for the subsequent sound detection. Following the display illumination, the ringtone from the modem sounds, and triggers the relay and switches ON the connected water pump. The monostable timer remains switched ON for a stipulated length of time, determined by the IC 555's R and C component values, after which its pin#3 goes low deactivating the entire circuit and the pump motor. However in the meantime if the user wants to switch OFF the pump he can do so by calling the modem for the second time within the time frame of the monostableactivation. Although the discussed cellphone operated water pump circuit for aiding poor farmers looks very simple, foolproof and cheap, it has its own drawbacks. The farmer is never able to know whether the pump was actually started or not, because there's no reverse acknowledgement from the modem to the user regarding this. The above issue can be though rectified by adding a momentarily activated siren, which will produce a loud ear piercing sound as soon as the pump is initiated or the water flow is detected. The siren sound should be loud enough to be heard over a radial distance of approximately a kilometer. This acknowledgement method will work only if the farmer's home is within the above mentioned distance from the pump motor. The above circuit will not consume your modem's talk time unlike the DTMF based systems which eats-up the cell phone talktime while it's in use for the required function. The circuit does not utilize complex parts or obsolete parts rather works with ordinary parts such as IC 741, IC 555, IC 4017. The circuit does not interfrere with the modem in any manner rather works without making any physical contact with the associated modem. The circuit is cheap and well suited for the proposed application and for the poor farmers.